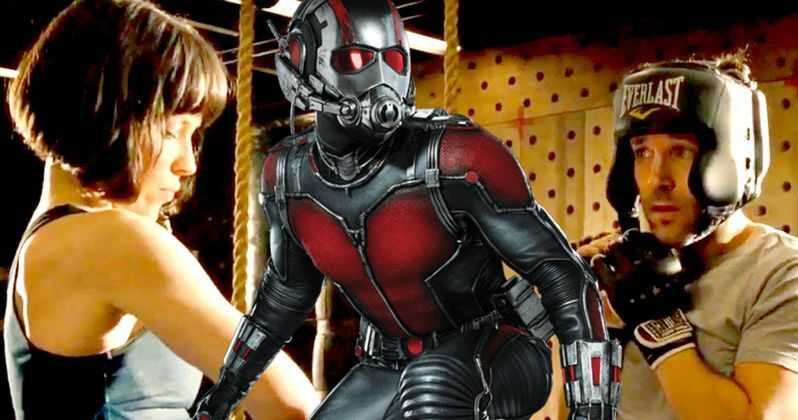 Our first look at the set of Marvel's Ant-Man and the Wasp has come and it reunites Scott Lang, Hope Van Dyne, and Hank Pym. The trio are set to start a new mission that will see Paul Rudd's Scott Lang character learning to balance family and his new Ant-Man identity. The story will involve the trio solving some unanswered mysteries from the past that may or may not involve Michelle Pfeiffer's Janet Van Dyne character who was announced last month at San Diego Comic-Con. Ant-Man and the Wasp production began at the beginning of the month and this is the first look that we have seen from the set. SO far we have only seen Michael Douglas, Evangeline Lilly, and Paul Rudd, but it is expected that Judy Greer, Michael Pena, Abby Ryder Fortson, Bobby Cannavale, Tip "T.I." Harris, and David Dastmalchian will all reprise their roles from the first installment. In addition to Pfeiffer, new comers to the sequel will include Walton Goggins, Laurence Fishburne, Hannah John-Kamen, and Randall Park. The new Ant-Man 2 set photos come to us via JustJared and they show Paul Rudd, Evangeline Lilly, and Michael Douglas on set in Atlanta. Rudd has been out in Atlanta to shoot for Avengers: Infinity War recently, but last week was the first time that Lilly and Douglas had been to the set. Lilly took to Instagram to mark the occasion by posting a picture of her tones arms with a caption that's reads: "Wasp ready arms. They better be. First official day of shooting for me tomorrow!" Besides the behind the scenes, candid shots, the pictures appear to show Scott Lang looking a bit scruffy while Hope Van Dyne and Hank Pym appear to be in professional attire. The new set photos come after a brief teaser announced that production has started, with filming commencing in San Francisco and Atlanta. It has been revealed that the sequel will take place after the events of Captain America: Civil War. A recent casting call for Ant-Man and the Wasp went out looking for prisoners and prison guards, which has lead to speculation that there could be a return to The Raft prison from Captain America: Civil War. The casting call is only for a day's worth of work, so the Raft, if it's involved at all, will be a relatively short portion of the sequel. There have also been rumors that Jeremy Renner's Hawkeye character could make an appearance in Ant-Man and the Wasp, but those details are still being kept under wraps at this time. Since Avengers 4 is also currently shooting in Atlanta, the possibility of more characters from the MCU joining in on the sequel are pretty high, especially after the success of the first Ant-Man movie. More information is expected to drop soon as the production cranks along, but for now you can check out the set photos from Ant-Man and the Wasp below ahead of the July 6th, 2018 release date.